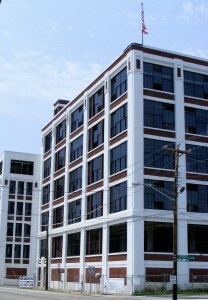 The former American Can Factory in Northside. The American Can Co. building at 4101 Spring Grove Ave. in Northside has been empty ever since I can remember. Unlike the Crosley Building, its rough exterior looks like it is due more to weather and age than vandalism, although taggers have been inside. Weeds grow along cracks in the blacktop of the empty parking lot. The sound of water dripping from a thousand places is audible from a hundred feet away. It sounds like the building itself is speaking, proclaiming its neglect and calling out for someone to restore it to its former glory. That may happen. Developers Bloomfield/Schon+Partners have received $1.6 million in stimulus money to turn the relic into a residential/commercial complex with 96 loft apartments and 27,000 square feet of retail space. The building has been designated an historic site, and in a nod to its past, the developers plan to incorporate the old machine tools into the furniture and art. 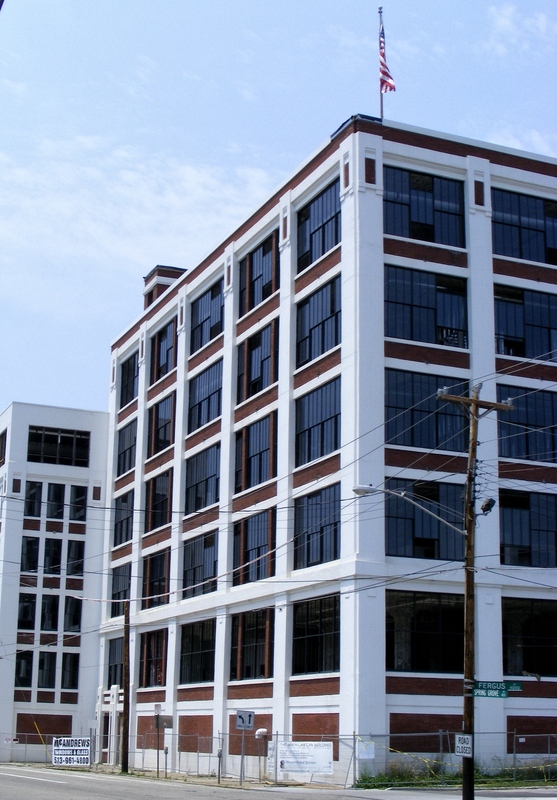 In 2006, work began on the cleanup of environmental hazards that needs to be completed before the American Can Factory Square project can begin. Developers are hoping that the apartments will attract new residents, and the new businesses will create jobs. This will increase the tax base and at the same time rid the neighborhood of the blighted building. It is only a block away from the proposed Mill Creek Restoration Project, a 13.5-mile public green space for recreation along the Mill Creek that would create approximately 445 jobs and connect to public transportation, bike trails and pedestrian walkways. From 1921 to 1961, the red and white, five-story building manufactured tin can-making machinery. Thereafter it housed the Cincinnati franchise of the Cleveland Automatic Machine Co. It has been empty for years.